We build custom gazebos. We build custom sun arbors. While the project may change, our philosophy remains etched in stone: bring passion, creativity, professionalism, transparency, skill and distinct beauty to each and every gazebo or sun arbor we build. From design to your final walk-through, you will have a team of consummate professionals ready to create the gazebo or sun arbor of your dreams. 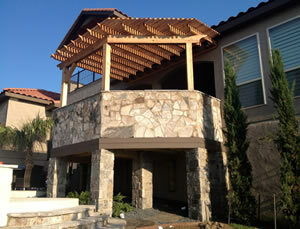 San Antonio, TX homeowners can easily find the new sun structure expertise they need at Creative Backyard Concepts. Gazebos and sun arbors in San Antonio, TX? Enjoy your outdoor space even more with a custom built gazebo. 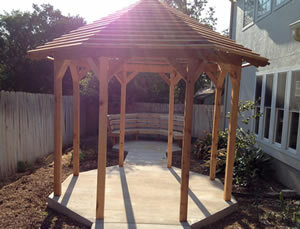 Gazebos are custom crafted additions to your deck or patio that are roofed. They allow you to have a small area that can be screened or opened and provide cover from the sun and rain. Creative Backyard Concepts, has been building gazebos for many years and would be happy to provide a custom gazebo estimate for you. Our gazebos have allowed many homeowners to get the most out of their outdoor living space. Creative Backyard Concepts can plan, design, and build a custom gazebo from start to finish. 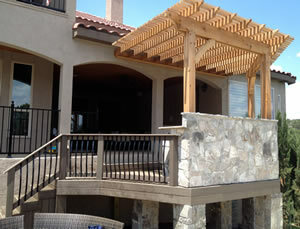 Bring shade and enjoyment to your outdoor space with a custom sun arbor. Sun arbors are striking landscape features that help to define your yard or patio while serving the function of controlling, or mitigating the sun. As distinct elements of landscape architecture, these structures help to frame an existing space and show off it's attendant functions, whether as a focal point for dining or entertaining. Creative Backyard Concepts can work with you to design, plan and build your custom sun arbor. Overtime sun arbors and gazebos begin to show signs of wear and need to be refinished, sealed or repaired. Creative Backyard Concepts can repair any sun arbor or gazebo to restore it back to its original untarnished look. © 2015 Creative Backyard Concepts. All rights reserved.